The emergence of chemoimmunotherapy in the frontline setting of extensive-stage small cell lung cancer (SCLC) offered a potential new standard of care to a previously stagnant space, said Aaron S. Mansfield, MD. However, he added, there is still work remaining to improve the outlook for this disease. In March 2019, the FDA approved the combination of atezolizumab (Tecentriq) plus carboplatin and etoposide for the frontline treatment of this patient population. The regulatory decision was based on findings from the phase III IMpower133 study, which showed a significant improvement in overall survival (OS) with the combination compared with chemotherapy alone. At a median follow-up of 13.9 months, median OS was 12.3 months with the addition of atezolizumab compared with 10.3 months in those who received chemotherapy alone, translating to a 30% reduction in the risk of death (HR, 0.70; 95% CI, 0.54-0.91; P = .0069) with atezolizumab.1 Moreover, the chemoimmunotherapy combination resulted in an increased median progression-free survival at 5.2 months versus 4.3 months in the control arm. 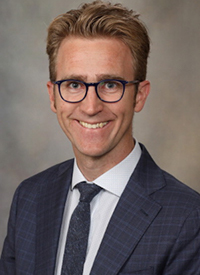 In an interview with OncLive, Mansfield, an associate professor of oncology and a consultant in the Division of Medical Oncology at Mayo Clinic, discussed recent progress in SCLC and remaining challenges in the field. OncLive: What is the current treatment paradigm for patients with extensive-stage SCLC? Mansfield: For decades, our standard of care has been a platinum doublet, either cisplatin or carboplatin with etoposide. We have not been that successful at improving upon that. This treatment is actually fairly effective in terms of shrinking tumors; there is a very high response rate. The problem is that those responses are not durable. After an initial response, the tumor often progresses very soon after. This is a disease with a poor survival—medians have always been under 1 year. Could you expand on the challenges with developing effective treatments in this space? There are many challenges with developing drugs for SCLC. One of them is the lack of tissue we have to study. A lot of the time, patients are diagnosed from cytology or from a pleural effusion because they present with advanced disease and many symptoms. They are often hospitalized or come through the emergency department, and we don't have the luxury of time to obtain adequate tissue samples. Also, it is very rare that these patients go to surgery to have their disease removed, whereas in non–small cell lung cancer (NSCLC), several of those patients can go to surgery. [In NSCLC], we have tissue repositories and we are able to study them in more detail. That's why we've seen a proliferation of targeted therapies in that disease, but SCLC has been much more difficult to study. What are some of recent advances that have been made in this area? There are several ongoing trials looking at different therapeutic approaches. The one we presented at the 2019 AACR Annual Meeting was an update on a chemoimmunotherapy combination. Other studies have looked at temozolomide (Temodar) and PARP inhibitors. There are proteins expressed in SCLC that researchers are trying to target with antibody-drug conjugates. Most of these endeavors have not been successful, but that isn’t due to a lack of effort. What is the rationale for the field shifting toward chemoimmunotherapy combinations? The exact mechanism to how this works is elusive, but when certain drugs make it into the second- or third-line setting, we sometimes see them combined with the frontline [agents]. First, we have seen that chemotherapy and immunotherapy can be safely combined together in NSCLC. In the trial we presented here, we saw that giving the drugs led to no increase in adverse events. In the lab, we do find that some chemotherapies upregulate PD-L1 expression, so that does provide rationale for blocking PD-1/PD-L1 from interacting with one another.